The Ashton Classic Corona is tagged with free shipping. If you order this product, your entire order will receive FREE BCP Ship Saver shipping! Ashton Classic Corona is a pleasantly mellow smoke, offering tasting notes of cedar, cream, subtle vanilla, and almond in a traditional 5 1/2 x 44 Corona vitola. The Ashton line is always excellent. A smooth smoke with a mild to medium flavor. Perfect with a Pale Ale or a Scotch. Ashton has been my favorite cigar for over 30 years. Always consistent, with a great draw and mild flavor. 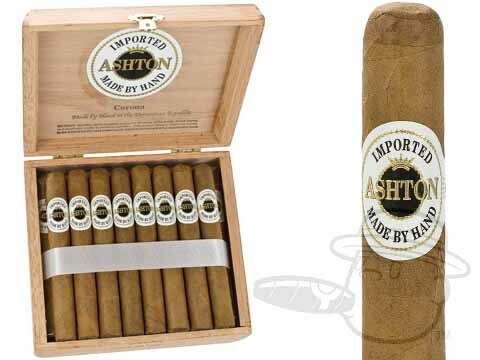 Being new to cigars these Ashton's are very mild and easy to smoke of the ones I have tried. I have been purchasing Ashton Corona's for the last 2+ years and have found every cigar consistent in its aroma, flavor and burn capacity. I am never surprised when I offer one of these cigars to a friend and they enthusiastically comment on cigar. Its performance is top notch. A wonderful little cigar in all aspects. Long burn time. Great construction. Smooth from beginning to end. Perfect with an Irish Whiskey and a good friend. Ashton Classic Corona is rated 4.1 out of 5 based on 11 customer ratings.